I made this Windwool Cloth Farming guide to help out players who want to farm the cloths instead of buying them from the Auction House. I decided to search for places with high density of mobs which I can kill and drop [Windwool Cloth]. 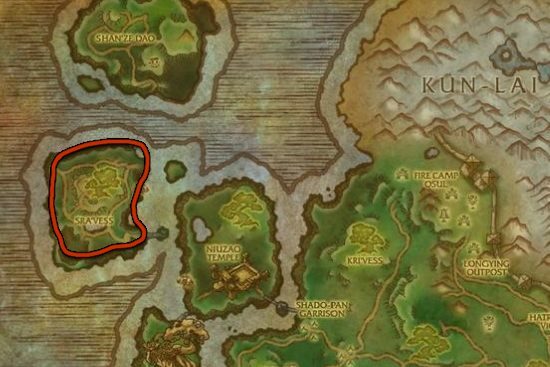 I traveled around Pandaria, and after a while I made a list of places. [Cloth Scavenging] also works on Pandaria mobs. You can learn this skill by completing the Cloth Scavenging quest, which is given by Charles Worth at Dalaran (Northrend). This NPC exists in Broken Isles Dalaran too, but he won't teach you Northrend Tailoring. With [Cloth Scavenging] tailors will get a lot more cloth than non-tailors. Dread Wastes is the best place to farm Windwool Cloth. You will farm five groups of 8 Ik'thik Warriors and one Ik'thik Slayer. 1. Click on the clock under your minimap, then click on the stopwatch icon. Start this stopwatch after you killed the first pack of mobs. 2. Go to 58.13, 48,39. You can see this spot on the map below. 3. 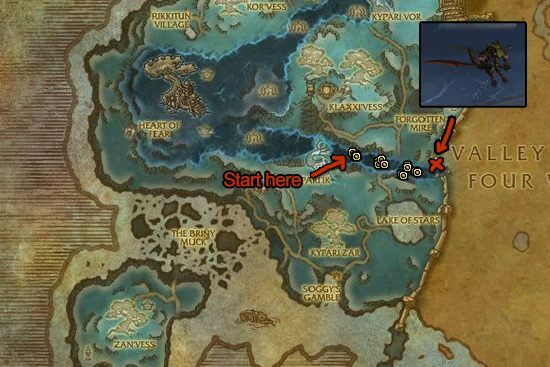 Kill the first mantid pack, then start moving towards Valley of the Four Winds and kill the 4 remaining Ik'thik Warriors groups. There is one elite scorpion and 3-4 mantid at the first two pack of Ik'thik Warriors. Only kill the scorpions and his guardians if you have decent gear. 4. After you killed the 5th pack of Ik'thik Warriors, check your clock. If it's at 3 minutes or more, you can go back where you started because the respawn rate is 3 minutes for these packs. 5. Decent geared players will kill the five packs really fast, in about 1.5-2 minutes. This means you will have 1 minute downtime before the mobs start respawning. Go to the spot marked with red X on the map, it's on the wall. Then stand near Jonathan Jacobsen. Here is a screenshot where you should stand. Now, you will see waves of Ik'thik Warrior flying over the wall, use any ranged ability to tag these mobs. I usually tag 2-3 mobs, kill them, loot, then repeat. Stay here until the first pack of mantids respawn(3 minutes from when you killed them). You can type /console cameraDistanceMax 28 in chat to increase the max camera distance, then use the scrollwheel to zoom out. It's a lot easier to tag the mobs this way. If you have done some questing in Dread Wastes, you can get a few useful buffs from the Klaxxi. I recommend Angel of Death from Kil'ruk the Wind-Reaver, or Raining Blood from Xaril the Poisoned Mind if you are killing the elite scorpions. You can also use Battle Hymn from Skeer the Bloodseeker as the second buff. Sra'Vess is a great alternative to Dread Wastes. 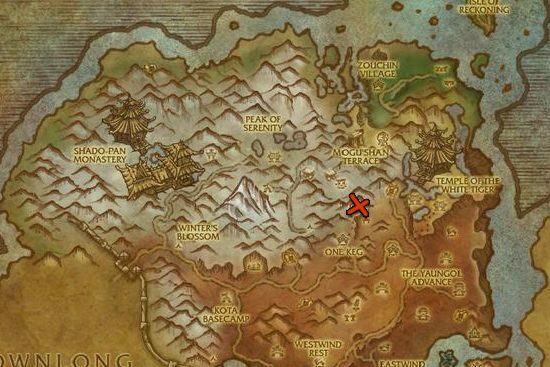 Howlingwind Cavern in Kun-Lai summit is also a decent place to farm. You will find Mischievous Snow Sprites and Suspicious Snow Piles in the cave. You can open the snow piles by stepping on them or using AoE spells.